When I logged in the other day in the festival area, a distinct lack of festival NPC's caught my eye. I had missed the last day of the festival, aargh! I almost had enough tokens to get the beautiful new festival dress when I logged off the evening before, but now I'll have to wait another year to get it. I'm absolutely terrible at remembering such things as festival dates. Sigh. From left to right: Black Moria Uruk Appearance (Blackarrow), Shak-hai Smith Appearance (Blackarrow), Corpulent Orc Appearance (Reaver) and Drake masked Gangling Appearance (Defiler). Click here for a larger image. I might add more pictures later. There is a skin available for 1 token and one for 2 tokens. My account is 4 years old, so that meant I could choose between either the cheap or the more expensive skin, but I could not get them both. I got my boyfriend to roll a creep, try a skin, and then reroll the same class to try the other skin. He doesn't play his creeps seriously anyway, so he had not done anything on them yet and didn't care to delete and recreate. The result was a great fashion show of which the mannequins would cause Charles Worth to turn in his grave. Somehow I'm a lore-addict on freep side, but as soon as I'm on creep side I don't really care anymore (sorry, creeps!). Sure, you can name your creep something terrifying in Black Speech, but I'm fine too with horrible puns. Thus I created a spider called "Ravenomous" and eventually settled for the dark purple skin (picture below) because it looked, well, more er... 'venomous' than the other. Also, I've already seen a lot of people run around with the pretty epic hairy one (picture above), and it's a bit boring to look the same as everyone else. After doing the introduction quests on my new spider (sweet commendations! 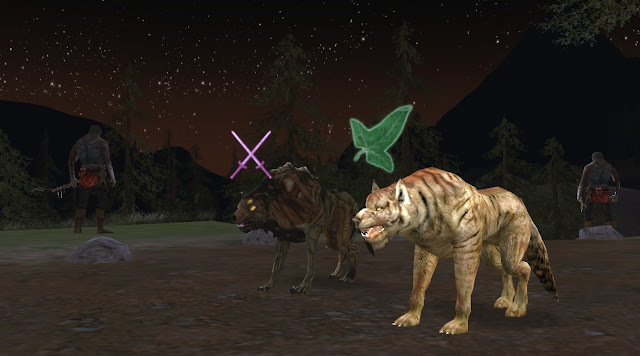 ), I spent the rest of the evening sneaking around in a warg pack with my tribe mates. It was great fun! I'm rank 3 and still feel extremely squishy, but it's not as bad as it used to be. Not sure if my rank 0 boyfriend warg agrees, but let's keep it at that. It's funny how being stealthed is still bugged: instead of half look-through we are all totally look-through, even while in the same fellowship. We therefore marked each other so we could at least know where everyone was. I love sneaking around in a group, it's so much fun, especially when chatting on Vent! 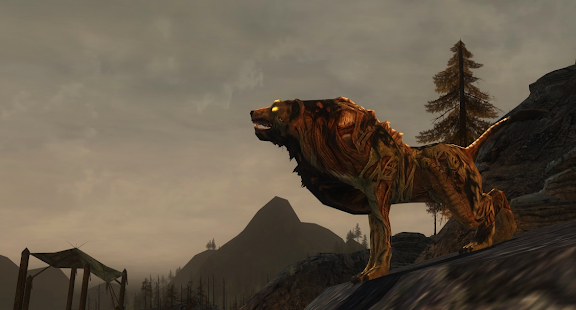 I choose the Twisted Warg skin from the Tower of Orthanc Acid trash (picture below, left warg) - gosh those things totally freak me out when I'm raiding! It's getting better now we don't wipe on every trash pull anymore, but those three yellow staring eyes are still pretty creepy. Below my boyfriend and I at our most common spot of residence (sigh) yesterday: see how totally disgusting I look! Why oh why didn't I take that beautiful tiger-like skin my boyfriend took? I guess I hope everyone is as much of a whimp as I am. I myself would certainly totally freak out if I would get sneaked upon by a warg looking like myself. If a creep is capable of looking "lovely", then you pulled it off. The images of the spiders and knowing I just got eaten alive by a similar one yesterday gives me the heebie-jeebies. Great shots! Aww about the festival. Mebbe someone nearby can loan you an outfit to put in your wardrobe? ORRR.... check the AH. Someone will sell them! 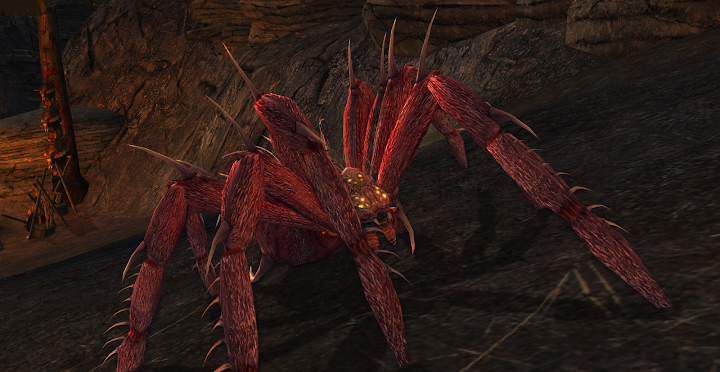 I don't know about other people, but if I saw a warg like that sneaking on me, my first thought would be "Oh, crap!". The second would probably to desperately fight for my life. BTW, Ironyca is a judge for WoW "Transmogrification" Festivals. Hehe, this was more of a small between-friends fashion show, but that sounds like fun. Yay for learning new words: "Transmogrification" (wow, use that in Scrabble!) and "to get Ruthed" - nice! I was actually wondering earlier today what a Silent Life newbie would look like and I think it's pretty cool that there even is a special word for it.